Built 1912 by Dundee Shipbuilding Co. Dundee, for..
May.1912 Registered Corona GY 684 (Gy & N.Sea S.F.). 1915 Requisitioned by the Admiralty for use as a patrol vessel. The "Corona" survived unscathed when attacked by enemy seaplanes near Elbow Buoy, ten bombs dropped. Her crew then exploded a German mine by rifle fire at a distance of 20 yards, causing a large volume of water to fall on the deck with fragments of mine. The "Corona" picked up one survivor from the cargo ship "Sigrun I" (Norwegian), which was disabled and in a critical condition. The rest of the crew were taken off by the drifter "Rooke". Lieutenant Irvine, RNR ("Corona"), and three men spent the night on board trimming the vessel, which was then towed into Ramsgate the following morning by "Corona" and "Rooke", in a north-west gale with a heavy sea. £2,000 salvage was awarded. Lieutenant Irvine, RNR ("Corona"), assisted the trawler "Abelard" into Dover after she had been mined. He received a letter of appreciation from the Admiralty for his judgement and seamanship on this occasion. the "Corona" was sunk by a mine off Ramsgate at 6.30 am. (Matthias Graf von Schmettow). Thirteen lives lost. The armed trawler Corona, in March, 1916, by remarkably skilful seamanship, piloted a mined vessel to Dover. A few days later the Admiralty recognised the exploit in a letter to Lieutenant J. Irvine. Simultaneously with the receipt of the news from headquarters the Corona herself struck a mine and was lost, the gallant lieutenant being killed. 06 February 1916 - Drowned in Ramsgate Harbour. NORRIS George Henry Edward Deck Hand, No. 2644 SD. RNR. Born 14 December 1879, Walmer, Deal. Husband of Emily Norris, Wolleston Road, Lower Walmer, Deal. RNR District: Deal. ALLBONES, George William (50) Engineman, No. 1883 ES. RNR. Born 30 July 1865, Grimsby. Husband of Bessie Allbones, 86 Tiverton Street, New Cleethorpes. Born Grimsby. RNR District: Grimsby. CHANDLER, Reginald Alfred (33) Ordinary Telegraphist, No. Z/101 RNVR. Son of Laura, Ellen, 62, Heron Road, Herne Hill, London. S.E. CLIFTON, Thomas (52) Second Hand, No. 1025 SA. RNR. Born 30 April 1863, Aylesbury, Buckinghamshire. Husband of the late Charlotte Clifton (nee Nundy), of 50, Ravenspurn Street, Grimsby. COULTER, William John (42) Trimmer, No. 723 ST. RNR. Born 6 August 1876, London. Husband of Ada Coulter, 408 Cable Street, Shadwell, London. Father of Charles H. Coulter. RNR District Dock St, E.
CRAWFORD, Alexander (30) Trimmer, No. 559 ST. RNR. Born 16 January 1886, Govan, Lanarkshire. Son of the late Alexander and Jessie Crawford; Husband of Mrs. Annie Crawford, of 72, Greenfield Street, Govan, Glasgow. RNR District: Glasgow. GILCHRIST, Bertram (22) Leading Signalman, No. Z/142 RNVR. Born 1 October 1893. Son of Richard and Margaret Gilchrist, of 151, Eglesfield Road, South Shields. RNVR Division: Tyneside. HALL, Frederick (41) Trimmer Cook, No. 123 TC. RNR. Born 18 May 1874, Woodbridge, Suffolk. Husband of Harriet Hall, 7, Breydon Tee, Cobholm, Gt. Yarmouth. RNR District: Grimsby. IRVINE, James Lieutenant, No. 01748 RNR. Born 9 February 1885, Yamba, New South Wales, Australia. UK Address: 66, Lillie Road, West Brompton. London S.W. B.o.T. Certificate dated 26.05.1913, No. 040079. Rank: Lieutenant. Date of Seniority: 12 March 1915. Appointed to Active service 7 April 1915, to "Ceto" [Ramsgate A/P Parent ship. ], for trawler "Corona", in command. JONES, William (38) Engineman, No. 1885 ES. RNR. Born 5 April 1877, Grimsby. Husband of Ellen Jones, of 282, Cleethorpe Road, Grimsby. RNR District: Grimsby. MacKINNON, Duncan (22) Deck Hand, No. 1145 SD. RNR. Born 1893, Bernera, Harris. Son of Finlay and Mary MacKinnon, of Bernera, Lochmaddy, Isle of North Uist. RNR District: Stornoway. RUSSELL, Alfred Henry (20) Deck Hand, No. 5615 DA. RNR. Born 3 November 1896, Ramsgate, Kent. Son of Charles William and Emma Russell, of 3, Denmark Road, Ramsgate. RNR District: Ramsgate. SMITH, David Bennett (34) Deck Hand, No. 3018 SD. RNR. Born 10 June 1882, St. Andrews, Fifeshire. Son of Joseph and Agnes Smith, of Street, Andrews, Fife; Husband of Janet Smith, of 30, Marton Burn Road, Grove Hill, Middlesbrough. RNR District: Middlesbrough. THORNTON, Frank Ernest (35) Skipper, No. 913 WSA. RNR. Born: 20 May 1880, Greenwich. Husband of Annie Ellen Thornton (nee Dales), of 66, Duncombe Street, Grimsby. RNR District: Grimsby. Pre-war Skipper (Certificate No. 8185), of Grimsby trawlers: "Ostero" 1908, "Fawn" 1909/10, "Reindeer" 1910 & "Buffalo" 1911. 1914 Requisitioned by the Admiralty, converted for minesweeping. The "Alberta" was blown up while sweeping a minefield off Grimsby. The skipper of "Orcades" her sweeping mate and former Grimsby trawler, undeterred by the explosion took his ship alongside the sinking vessel without hesitation to render assistance but while there the gallant skipper and five of his crew died when she was also blown up by a mine. Seven of "Alberta's" crew lost their lives. BEARD, Robert (29) Trimmer, No. 979 TS. RNR. Born 27 June 1886, Grimsby. Husband of Olive Ann Beard, 172 Rutland Street, Grimsby. RNR District: Grimsby. DURRANT, Charles (34) Trimmer/Cook, No. 279 TC. RNR. Born 13 July 1891, Metfield, Suffolk. Son of James and Georgiana Durrant, of New Road, Rumburgh, Halesworth, Suffolk. GIBSON, Robert Allen (22) Deck Hand, No. 9989 DA. RNR. Born 30 March 1894, Cleethorpes. Son of Sarah A. Gibson, 40 Kew Road, Cleethorpes. RNR District: Grimsby. HAMMOND, John Alfred Engineman, No. 1345 ES. RNR. Born 7 November 1884, Salford. Husband of Violet Sarah Hammond, 124, Blundell Avenue, Cleethorpes. RNR District: Grimsby. HORN, Percy Arnold (27) Engineman, No. 308 ES. RNR. Born: 26 August 1888, Grimsby. Husband of Amy Alice Horne, 123, Cooper Road, Grimsby. RNR District: Grimsby. STRATFORD, Sidney (45) Petty Officer, O.N. 142720 RN. Born: 08 April 1871, Poulton, Wiltshire. Husband of Elisabeth Stratford, 3, Duke Street, Grimsby. WRIGHT, Ernest (21) Deck Hand, No. 2131 DA. RNR. Born: 25 November 1895, Grimsby. NoK: Sister, Annie Elisabeth; 30, Clayton Street, Grimsby. RNR District: Grimsby. Jun.1911 Registered Orcades GY 640 (Dolphin S.F.). Sept.1915 Sold to Arctic Steam Fishing Co. Ltd. Grimsby. While sweeping a minefield off Grimsby "Orcades" was blown up and sunk by a mine after going alongside to render assistance to her sweeping mate and former Grimsby trawler "Alberta", which had been blown up moments earlier and was sinking. Skipper of the "Orcades" and five of her crew, lost their lives. Both vessels were lost along with a total of thirteen men killed or drowned. CAMERON, Duncan (30) Trimmer, No. 632 TS. RNR. Born: 6 April 1884, . Corpach, Inverness. Husband of Florence, 72 Kent Street, Grimsby. RNR District: Aberdeen. CULLEY, Benjamin Alfred (24) Trimmer, No. 135 TS. RNR. Born 28 September 1891, Harwich, Essex. Son of Harry James and Linda Elizabeth Culley, of Harwich, Essex. RNR District: North Shields. FROST, Robert Skipper, (23) Skipper, No. 81 DA. RNR. Born 5 February 1893, Hull. Husband of Mrs. Frost, of 152, Albert Avenue, Hull. RNR District: Hull. JOHNSON, Ernest (31) 2nd Hand, No. 336 SA. RNR. Born 18 December 1881, Hull. Husband of Emma Johnson, of 158, Division Road, Hull. RNR District: Hull. STEER, Harry (22) Deck Hand, No. 3061 DA. RNR. Born 4 January 1894, Grimsby. Son of Jasper and Alice Steer, of 65, Montague Street, New Clee, Grimsby. RNR District: Grimsby. WOOLER, Harry Douglas (37) Leading Seaman, No. 4346 B. RNR. Born 13 October 1887, Douglas, Isle of Man. Son of the late Samuel Wooler; husband of Beatrice Wooler, of 254, "J" Block, Guinness Buildings, Vauxhall Walk, Lambeth, London. patrol duties at Dover. Admiralty No.3353. Armament: 1 x 3 pounder. The "Equinox" was damaged when the German Zeppelin "L.12"
(C.O. Oberleutenant Peterson), bombed Dover Harbour by mistake. When "L.12" arrived off the coast between Margate and Herne Bay, Peterson believed he had been carried by strong winds well to the north of Harwich, his intended target. He turned and headed south reaching Dover soon after midnight. Believing he was now over Harwich he commenced bombing the Dover harbour area but was met at once by intense anti-aircraft gunfire and his ship was hit. Three of his twelve bombs fell on land and the rest were hurriedly dropped into the harbour to allow the Zeppelin to climb towards its ceiling, but she had sustained serious damage, losing gas, causing her to slowly descend towards the water as she headed for Zeebrugge. A few miles off there she was picked up by a German torpedo boat and towed into Ostend. At 08:30 on the 10th. Flight Commander J.R. Smyth-Pigott had taken off from Dunkirk in a B.E.2c to look for the crippled Zeppelin. He found her some three miles off Ostend being hauled down by the destroyer that had taken her in tow. He attacked with two twenty-pound bombs and six grenades from a height of 500 ft., under heavy fire from torpedo boats in the area and shore batteries. Then seeing that the raider's back was broken he turned away and returned to base. Later it was learned "L.12" was destroyed by fire while in the process of being dismantled. In his book "The Dover Patrol 1915-17", Admiral Bacon gave this description of the incident:- "the "Equinox" was not actually struck by a bomb, but one passed within an inch or two of the gunwale opposite the forecastle accommodation, and exploded on the surface of the water. The explosion was most violent, and wrecked the forecastle sleeping-place, where four ratings were in their bunks. Two ratings were killed outright and one dangerously wounded but afterwards recovered. The side of the vessel and the funnel were riddled with small holes." I have only found one naval rating who was killed, but I did come across a casualty report associated with this bombing that lists: One killed, one seriously injured and two slightly injured. I am confident these four (as listed below), are the four ratings who were in the forecastle. Another Grimsby trawler that served in the "Dover Patrol", the "Cleon", was anchored close to the "Equinox" in Dover Harbour, she was damaged in the bombing but didn't suffer any casualties. However she was mined and lost with all twelve hands on 1st February 1918, details of the loss are listed in the 1918 records. The "Equinox" was replaced, repaired and returned to her owners. Just over a year later on 25 August 1916 while on a fishing trip, she was mined 39 miles S.E. by E. from the Humber Light Vessel, and lost with all nine hands. On the 30 September 1916 she was given up for lost, nothing having been heard of her since she was sighted on August 25, by the Grimsby trawlers "Emu" and "Eagle", and later they heard an explosion. There are no records of mines being laid by U-boats in this area before this date. It is most likely that she sank in the same minefield that accounted for some Grimsby fishing vessels in 1915 ("Dovey", "Cheshire", "Perseus", "Tors"). A map that includes the German minefields as of May 31, 1915, shows a mined area in that region which would appear to correspond to the minefield laid by "SMS Nautilus" in 1914. Nine lives lost including her Skipper. MORRISON, Thomas (28) Deck Hand, No. 3987 DA. RNR. Born 28 February 1887, Aberdeen. Husband of Johanna Morrison of 7, Justice Lane, Aberdeen. RNR District: Aberdeen. 10 August 1915: Bomb Casualties. BOYLE, William Duguid (34) Trimmer No. 2533 T.S. RNR. HANLEY, John (42) Deck Hand, No. 7577 DA. RNR. Born 7 December 1873, San Francisco. British Parents: Dominick and Mary Hanley, C/o Philips Strand, Swansea. RNR District: Swansea. BRIGGS Joseph Robert (55) Steward. Husband of Mrs. Briggs, of 38, Albion Street, Grimsby. Born in London. Born Hull Son of Annie Eliza Day, of 128, Tunnard Street, Grimsby and the late William Samuel Day. GLENTWORTH Herbert (46) Skipper, Certificate No. 3428. Husband of Harriet Parkinson (formerly Glentworth), of 154, Willingham Street, Grimsby. Pre-war skipper of Grimsby trawlers: "Cockatrice" 1905, "Cardiff" & "Whitby" 1907, "Minotaur" 1908 to 1912, "Hydra" 1912/13. JENKINS Henry (54) Second Hand, Certificate No. 1764. Born London. Son of the late Mr. and Mrs. Jenkins; husband of Alice Elizabeth Jenkins, of 298, Willingham Street, Grimsby. Pre-war skipper of the Grimsby trawler "Rugby" 1910 to 1913. LITTLEHALES Charles Henry (21) Deck Hand. Born Wolverhampton, of 92 Stirling Street, Grimsby. Former Grimsby Sea Fishing Apprentice, signed indentures 16 July 1909. MORTLOCK Arthur (53) First Engineer. Born Grimsby. Husband of Alathea Mortlock (nee Stork), of 315, Heneage Road, Grimsby. SMITH John (40) Second Engineer. Born Grimsby. Husband of Mrs. Smith, of 144, Castle Street, Grimsby. TAYLOR George Alfred (23) Third Hand. Born Rattlesden, Suffolk. Son of Anna Ellen Taylor, of Marsh Green, Drinkstone, Bury St. Edmund's, Suffolk, and the late Herbert Taylor. Born Gloucester. Son of May Waite, of 2, Leopold Road, St. Andrew's Park, Bristol, and the late Alfred John Waite. Signed Indentures 12 Dec.1913. Served on "Amelia" 1914 & "Aquarius" 1915. Grimsby & N. Sea Steam fishing Co. Grimsby. Jul.1915 Sold to Roberts & Ruthven, Grimsby. Report in the "Times", News in Brief column: "The Grimsby Trawler "Revigo" struck a mine at 11 o'clock yesterday morning and sank in 10 minutes. All the crew, who were able to take to the boats before the vessel sank, were afterwards picked up by the Grimsby trawler "Andromeda", which landed them at Grimsby last night." The "Andromeda" was captured by "UC 16" (Egon von Werner), 39 miles S.E. by E. of Spurn Light Vessel. She was sunk by gunfire, after her crew had taken to the ship's boat. They landed safely. The "Phoenix" was captured by "UC 16" (Egon von Werner), 45 miles E.S.E. of Spurn Light Vessel. She was sunk by gunfire, after her crew had taken to the ship's boat. They landed safely. The "Viella" was captured by "UC 16" (Egon von Werner), 38 miles S.E. by E. of Spurn Light Vessel. She was sunk by bomb, after her crew had taken to the ship's boat. They landed safely. Nov.1903 Sold to A. Bannister, Grimsby. Jan.1916 Sold to Grimsby Group Owners. The "Britannia III" was captured by "UC 16" (Egon von Werner), 42 miles S.E. by E. of Spurn Light Vessel. She was sunk by gunfire, after her crew had taken to the ship's boat. They landed safely. The "Refino" was captured by "UC 16" (Egon von Werner), 39 miles S.E. by E. of Spurn Light Vessel. She was sunk by gunfire, after her crew had taken to the ship's boat. They landed safely. Built 1903 by G. Cooper, Hull for G.F. Sleight, Grimsby. The "Rego" was captured by UC 16 (Egon von Werner), 40 miles S.E. by E. of Spurn Light Vessel. She was sunk by gunfire, after her crew had taken to the ship's boat. They landed safely. Built 1891 by Earle's S.B. & Eng. Co. at Hull for J. Grant, Grimsby. The "Weelsby" was captured by "UC 16" (Egon von Werner), 40 miles S.E. by E. of Spurn Light Vessel. She was sunk by bomb, after her crew had taken to the ship's boat. They landed safely. North Lincs Steam Fishing Co. Ltd. Grimsby. The "Devonshire" captured by "U 57" (Carl-Siegfried Ritter von *Georg), 33 miles N.E. 1/2 N. of Spurn Light Vessel. She was sunk by gunfire, after her crew had taken to the ship's boat. They landed safely. *A note on Carl-Siegfried Ritter von Georg. When he sank the "Devonshire", he was Kapitänleutnant Carl-Siegfried Georg. Georg was a Bavarian, on April 25, 1918 the King of Bavaria bestowed the Military Order of Max Joseph upon him. This award carries with it a knighthood ("Ritter von"), if the recipient is a Bavarian. Thus Carl-Siegfried Ritter von Georg. Description: Motor Fishing Vessel. Wood, carvel built, ketch rigged. by Bergius Launch & Engine Co. Ltd. Glasgow. 15 Aug.1916. Registered Jennie Bullas Gy 291 (E.E. Cox). The "Jennie Bullas" was captured by "UB 19" (Walter Gustav Becker), 14 miles E.N.E. of Spurn Light Vessel and sunk by bomb. St. Tr. 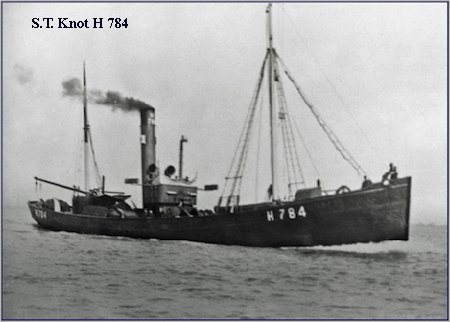 "Sutterton" brought in crew of the motor fishing boat "Jennie Bullas" sunk 2.30 p.m., 4th by German submarine. Approx. position 53.47 N., 0.33 E. Subm. was small, crew about 25, 1 small gun before C.T. slate colour, no numbers or marks. Used small sail to resemble a fishing boat. Believed to have steered North. Master's Deposition: Bd. of Trade, M. 52567. On Wednesday, 4th October, 1916 the weather fine and clear and the wind in the SW. the ship was 14' ENE. of the Humber Lightship when a German submarine was observed about 1/4 mile away on the Deponent's port quarter.The submarine came straight to the Deponent and hailed him to put his small boat out, which he did, and went to the submarine. The submarine then put two men into the Deponent's small boat and all returned to the Deponents vessel. The two men afore-said then gave orders for all the crew to leave the vessel by the small boat. These two men immediately went and placed a bomb on board. They also got into the small boat which was quickly rowed away. All had reached the submarine when the explosion was heard, which blew the decks right up, and doubtless she went on fire and sank. Deponent and his crew were all placed below on the submarine. The Deponent and his crew were kept on board the submarine from 3.30 to 7.30 p.m. Then they were all transferred to the steamer Gustaf of Sweden. . . . Built 1891 by Earle's S.B. & Eng. Co. at Hull for W. Smith, Grimsby. Oct.1892 Sold to G.F. Sleight, Grimsby. The "Restless" was captured by "UC 16" (Egon von Werner), 41 miles S.E. by E. of Spurn Light Vessel. She was sunk by gunfire, after her crew had taken to the ship's boat. They landed safely. Built 1896 by Mackie & Thomson, Govan for Hagerup & Doughty. Apr.1906 Sold to Consolidated Steam Fishing & Ice Co. The "Jersey" was captured by "UB 19" (Walter Gustav Becker), 16 miles N.E. by E. of Spurn Light Vessel. She was sunk by bomb, after her crew had taken to the ship's boat. They landed safely. The "Rado" was captured by "UB 19" (Walter Gustav Becker), 15 miles N.E. by E. of Spurn Light Vessel. She was sunk by bomb, after her crew had taken to the ship's boat. They landed safely. Description: Fishing vessel. Wood, carvel built two masted sloop. 42 gt. 70 ft. x 14.3 ft. O.N. 113990. Built 1898 by R. McAlister & Son, Dumbarton for Glasgow Owners. The "Rover" was captured by "UB 19" (Walter Gustav Becker), 10 miles E.N.E. of Spurn Light Vessel. She was sunk by bomb, after her crew had taken to the ship's boat. They landed safely. No casualties recorded. Registry closed 23 October 1916. In the early hours of Sunday morning, at the height of a terrific north-easterly gale the minesweeper "Knot" was driven on to the rocks near North Carr Beacon, at the mouth of the Firth of Forth. The violence of the stranding triggered an explosion in the ship's magazine, killing two of the crew, and another was washed overboard and drowned. Distress signals were first observed by the coast-guard at Fifeness. The Crail Lifeboat was speedily launched and soon reached the wreck, the crew of which were burning a blanket soaked in paraffin oil, having used all available rockets. Some of the lifeboat crew boarded the vessel as heavy seas washed over her and rescued ten survivors who were sheltering in the wheelhouse. The skipper stated it was the darkest night he had ever experienced. On reaching the lifeboat station at Fifeness it was found one of the men was quite exhausted and he was stretchered to a nearby farm and a doctor from Crail was sent for. Later that morning the men were taken to Rosyth. By that time the vessel was completely submerged, with only one of the masts being visible. Two of the men killed were from the North of Scotland, while the other was an Englishman. CLARK, Alexander, Seaman, No. 4891 B. RNR. Son of Mary Patience Clark, of Dock Cottage, Avoch, Inverness. GARRICK, Laurence Arthur, Deck Hand, No. 7307 DA. RNR. Son of James Garrick, of Berfield, Sandsound, Aithsting, Shetland, and the late Elizabeth Garrick. ROBINSON James, (29) Deck Hand, No. 1866 DA RNR. (Served as TAYLOR, James Robinson). Born: 10.12.1886, Grimsby. Husband of Sarah Ann Taylor Robinson, of 10, Liquorpond Street, Boston.